Coupling catchy rock with mature but not old lyrics, Nourallah has assembled the best album of his career. Salim Nourallah has spent the last decade putting together an impressive collection of music and has established himself as a noteworthy producer. With his latest album, Hit Parade, recorded with an energetic band of established musicians, Nourallah has expanded his pop sound into something more assertive and raucous. He's always been a smart songwriter, but he's further developed his ability to tap into domestic experience in ways that work. 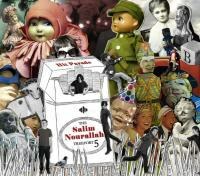 Coupling catchy rock with mature but not old lyrics, Nourallah has assembled the best album of his career. The musical shift is striking, but not out of character. Nourallah's always tapped into a power-pop tradition (especially with The Happiness Factor), but he's never shied from more meditative numbers. First cut “38 Rue de Sevigne” suggests an album headed in a soft direction, but it quickly transitions into something bouncier, opening the way for what's to come. The bitter “Everybody Knows” pounds its way into Who territory, with hammered drums and aggressive chordal riffing. That's not to say that Nourallah and this Treefort 5 band – which includes John Dufilho (Apples in Stereo/Deathray Davies), Jason Garner (Polyphonic Spree), Richard Martin (Shibboleth), and Joe Reyes (Buttercup) – have fully embraced Nourallah's Clash and Elvis Costello influences. Tracks like “The Quitter” harken more to Ray Davies and more of Nourallah's pop approach. While drawing from these acts, though, Nourallah creates something specifically his. Lyrically, Nourallah has embraced fatherhood and aging, but where these topics can mark the decline of a songwriter's vitality, Nourallah sounds especially invigorated. There's a maturity in his writing that sounds wise but still engaged in risk-taking, optimistic but not maudlin. “Unstoppable” feels like an older man's response to his own “1978”, but switching nostalgia for curiosity, and self-reflection for familial engagement. Both “Never Felt Better” and “Goddamn Life” consider the ambivalence found in honest self-reflection, but with hooks to spare. The attack of the music certainly prevents any of these songs from bogging, but Nourallah's also developed a wryness that hasn't always been present in his work. Beyond that, he's just funnier now. “Warriors of Love” has a humor that's easy to miss. Both the band and Nourallah as vocalist play the song with a certain amount of cheese, and the result is a puzzling number that works better when you realize it's mostly not in earnest. The following number, “Travolta” offers the album's most comical moments, starting with a description of a man with his “golf pants on … dressed to the nines” headed for the dancefloor before “the realization that you don't know what you're doing”. As the song progresses, though, it keeps the lighthearted tone but turns into something else. The final verse finds the man at his own wedding, still unsure what's going on, discovering “a riot in your heart, a panic in the church”. The silly disco uncertainty has turned into a genuine life crisis, but the whole things couched in such happy, engaging music that the whole point can be missed (which is sort of the point). These two songs succeed with a subtle confidence, and an embrace of the music that resists the uncertainty Nourallah's characters often experience, as on “Friends For Life”, the album's most sparse track, which marks a sad epiphany about change. Fortunately, Nourallah's anchors keep things from falling apart. A song to his daughter (and the first song Nourallah's ever recorded named after a girl), “Miette” closes the album with a gentle steadiness that restores focuses to a world in which friendships end, marriages don't make sense, and life makes you feel like “a millionaire dying with an empty purse”. Earlier, in “Never Felt Better”, Nourallah sang, “I've got everything I need / I've got nothing that I want / I've got everything I need / You've got nothing that I want”. It was an isolating statement in a song that acknowledges dependence. “Miette” revises the position, writing not only for someone's benefit, but to embrace their support. Hit Parade got a global start, with Nourallah writing “38 Rue de Sevigne” while in France, again in Europe and spending time with ex-pat Wreckless Eric. That traveler's rosiness gave way to honest struggles, all circling toward home and self. The album comes out of that place with wisdom, humor, and a welcoming of community. It makes the journey while avoiding the trappings of sentimentality while, importantly, letting Nourallah rock.